grade class at Maroun Elementary School in Phoenix. 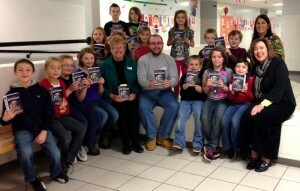 Pictured with the children are Rotarians Ellen Nowyj, Steve Manno and Peggy Donnelly along with Principal Mary Stanton. The Fulton Sunrise Rotary meets every Friday at 7 a.m. at Fulton’s Riverside Inn.